Affordable elegance. That is what we offer when you contract us to build and design your sun room, life room, conservatory, home addition, or deck. Your home is the cornerstone of your life: it is your place to relax, spend time with people you love, build your future, and celebrate your life. When it is time to add light and space to your home, our goal is to provide you with the best materials along with the designs and concepts that work well for your lifestyle… and within your budget. D&E DESIGNS is the premier contractor and builder of year-round glass sunrooms, solariums, LifeRooms, and conservatories in North America. We set the standard for our industry. ** D&E DESIGNS has taken our decades of experience in sunrooms and brought it to the vinyl replacement window, screen enclosure, pergolas and patio cover markets. D&E DESIGNS has been in business for over 35 years and are recognized as the industry leader in both products and customer service. We build additions that meet or exceed building codes. Our products can be custom designed to meet or surpass all architectural and building codes in your specific area. D&E DESIGNS provides global strength and we provide local expertise: industry-leading corporate strength and resources, combined with highly trained local independently owned and operated franchisees and dealers who live where you live, know what your needs are, and offer personalized attention and unparalleled local service. We build with glass that works - 365 days a year. 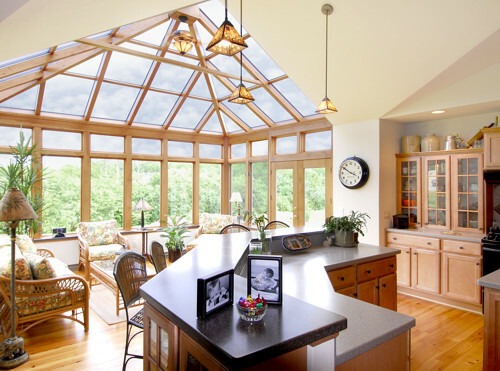 D&E DESIGNS Sunrooms’ industry-leading patented glass technology helps to provide all-day, all-night comfort, 365 days a year. It's the best glass in the business. We offer the best warranty in the industry on all our home products.